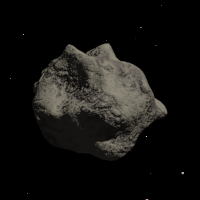 Imagine you are working on a 3D adaptation of the classical video game Asteroids. 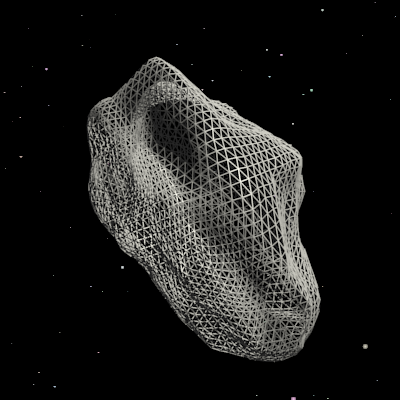 Your task is to write an algorithm that can create a random 3D asteroid. This is a popularity contest, not code golf. 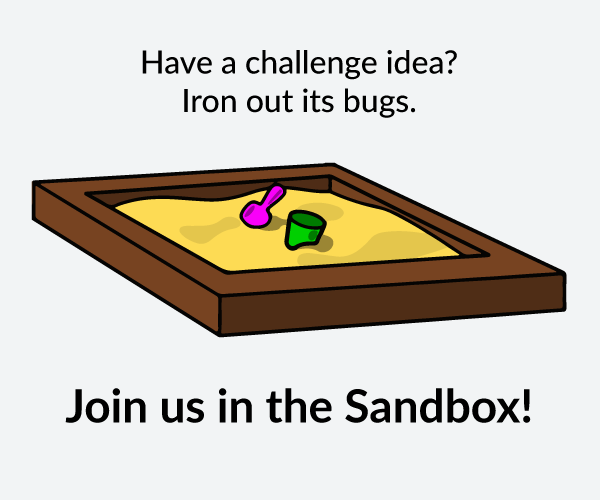 Write nice code and create interesting results. Add other cool features if you want. Your algorithm must actually create the model, not just load it from an external source or similar. The results must be (pseudo-)random. Running the algorithm several times must create different results. Real-time capability is desirable, but not necessary. The output must be a mesh, either in memory or as a file such as Wavefront OBJ. In either case you need to render it in some way. Explain your algorithm, so that everybody can learn from it. Show some images of your results. 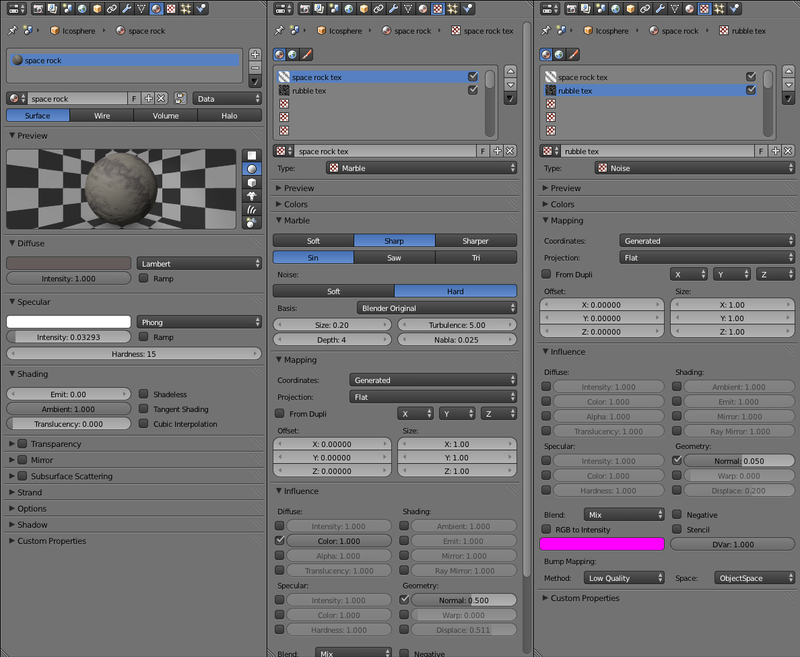 Blender's built-in Python scripting is perfect for this sort of thing. 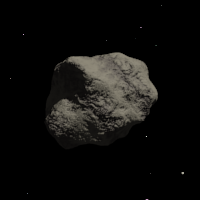 Want another asteroid? 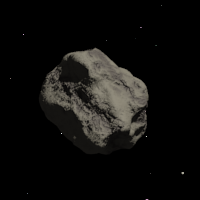 Move the 3D cursor somewhere else and then type asteroid() into the Python console again (or just ↑Enter to repeat the last line entered). 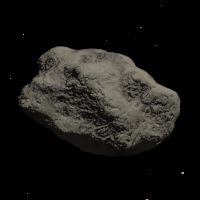 To make it look more like a piece of space rock and less like a blob of plastic, you need to apply a suitable material. The following procedural material works quite well. I used a diffuse colour of #635C5B, and #8D887F in the marble texture. Start by creating a simple icosahedron (bpy.ops.mesh.primitive_ico_sphere_add()). Enter edit mode (bpy.ops.object.mode_set(mode='EDIT')) and apply smooth shading so that the individual facets blend into one another (bpy.ops.mesh.faces_shade_smooth()). Select a random subset of the object's vertices (bpy.ops.mesh.select_random()). Scale them randomly in the X, Y and Z directions (bpy.ops.transform.resize()). Select the whole object (bpy.ops.mesh.select_all(action='SELECT')) and apply smooth subdivision to add new vertices by interpolating smoothly across the deformed object (bpy.ops.mesh.subdivide(smoothness=1)). Finally, exit edit mode and leave the object selected (bpy.ops.object.mode_set(mode='OBJECT')).